Thirteen (13) high school students participated in the various categories of Drama, Dance, Visual Arts, Instrumental and Vocal. Brother Antonio Ferguson served as the program chairman and Brother Brian Wilson and Brother Yahari Butler served as the committee co-chairmen of the event. Brother Ferguson expressed how fortunate they were to have a diverse variety of “such amazing high school talent” in this year’s event. Clarence Brown, III (Woodbridge High School) who won 1st place in the Instrumental category also won first place in the overall program. Clarence will go on to represent the chapter and perform in the 2nd District Talent Hunt program which will be held during the 68th District Conference on Saturday April 30, 2016 in Rockville, MD. Clarence will perform in the Instrumental category and Bethelehem Maleku will represent in the Visual Arts category. This year’s Talent Hunt program was graced by the performance of jazz musician and fraternity brother Willie Bradley. Bro. Bradley performed several selections during the intermission of the event and also served as a sitting judge for the vocal & instrumental categories. Brother Bradley expressed how pleased he was to see such remarkable and talented high school students perform. 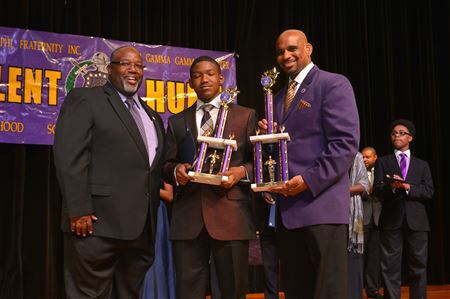 Brother Ferguson went on to state that he has every confidence that Clarence and Bethelehem who will be representing and chapter will be positioned well at this year’s 2nd District Talent Hunt program which should prove to be extremely competitive. Congratulations to all of this year’s performers.